How do I reserve a cottage? You may reserve a cottage either by sending your request through our website or by calling the office (207.563.6500) and speaking to one of the agents. We accept cash, personal checks, cashier/bank checks, money order and credit cards (Visa, Mastercard and Discover). You can also do an Electronic Funds transfer (EFT), there are typically fees that apply, and you would need to check with your bank. Your payments will be broken down into two payments. The first payment, which is half of the weekly rental price, will be due within 10 of the reservation. Your second payment, which will cover the remaining balance, will be due 45 days before your arrival. If you make your reservation within 60 days of your arrival, you will receive one invoice for the total amount. What other fees are involved in renting a property? 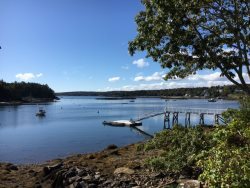 Besides the weekly price, there is also a 9% Maine Lodging Tax, a 5% Processing Fee, a Cleaning Fee (varies by property), a security deposit (which varies by property and is not taxable). If you are bringing a pet there will be a $45 non-refundable pet fee. Your payments will be broken down for you on your invoices and lease agreement. This will be returned to you by check. We try to release those back to renters within 7-10 days of departure as long as there are no damage issues at a cottage. If you want to cancel this agreement, you must notify us in writing. You remain financially responsible for your lease unless we are able to re-rent the property for your reserved time period to a replacement renter, which we will make every effort to do. If we are successful, we will refund what you have paid us, less a $100 Cancellation Fee. If we are unable to re-rent your reserved property, we will retain all funds collected from you, except your Security Deposit. We recommend all renters consider purchasing Vacation Rental Travel insurance. Do you offer discounts on cottages? In the off season (May, June, after Labor Day and October) some owners will offer a discounted rate check with the rental office for those offers. Can cottages be rented for shorter stays? In the off season (May, June, after Labor Day and October) some owners will allow for shorter stays with a 3 night minimum. Our guests can arrive at their rented cottage anytime after 3 pm, and check out is by 10am. If keys are not returned to our office by 11am on the day of check out there is a $50.00 late key return charge. Our lobby is available to guest 24 hours a day so that if you arriving during the evening hours you can still collect your welcome packet. Am I permitted to have overnight guests? Yes as long as you do not go over the maximum occupancy limit and you note that on your lease. Parking could be an issue for some of our cottages—we'll ask that you check in with us, and if need be guests may need to leave a car in our parking area for the night. What if I am bringing my pet(s), what is expected of me? One dog is usually all that will be allowed, some exceptions may be made. A few of our properties will accept cats. Please read through our pet policies. There is a $45 non-refundable pet fee: this is not a "cleaning fee" and is not designed to cover the cost of extra cleaning should there be additional hours needed due to pet hair. We do have a leash law—your pet must be on a leash when outside the cottage. Do I need to bring linens/towels? Yes, less than 10% of our properties supply sheets and towels. You can either bring your own from home or you can rent them from us. Some renters will even ship items to us to hold. Where can I rent canoes, kayaks or boats? Where can I receive packages or faxes? Here at our office - 277 Main Street, Suite 3. We will call you when items arrive. Please do not have packages shipped to the actual cottage. Smoking is not permitted at any of our properties. Send us an email or give us a call (207.563.6500)—if we can locate the lost items we will return them for a $25 fee plus shipping costs. If your property has a trash service you will find instructions in the cottage booklet. If your property does not provide trash service, you will find a map and hours for the transfer station in the blue cottage booklet. What is expected of me when I leave? We know that you are on vacation and cleaning is really the last thing you want to do. We ask that the cottages/homes are left broom swept and tidy. Since these are privately owned family homes please treat this home as if it was your own. What If I want to come back to the same cottage next year? Please fill out a reservation request for that cottage (keep in mind this is a "place holder" and not an actual lease). All of our contracts with property owners are renewed each year. Our goal is to have all properties re-listed and ready for reservations by November 1st. We do contact all renters from the previous summer first. We will be in the area checking out properties to rent for next season—may we preview potential rental properties? We do not show properties. If you would like address or driving directions in order to see the location of a property contact us. We try to supply as much information on our website as possible. You can also visit the Maine Tourism Association and request your free copy of the Maine Invites You Planning Guide. Do you allow weddings or family reunions at your properties? Unfortunately, none of our rentals allow any large gatherings. We have maximum occupancy limits on each of our rentals that should not be exceeded during your stay. The occupancy limits are set for both insurance and septic/water usage reasons. Can we have outdoor fires (camp fires) at the property? Only if the property has a fire pit or designated area for a fire. Can we pitch a tent on the property? No, tents can damage the grass underneath and can also lead to occupancy levels being exceeded. How do we reach you after normal business hours if there is a problem at our rental? In your welcome packet and also in the cottage booklet that you will find at the cottage is our 800 emergency number. We are on call 24 hours a day during the summer for emergencies. How is the cell phone coverage in Maine? Improving each year. Please check with us if you need more specific information. Possibly. As cell phone coverage improves, property owners are doing away with landlines. If a landline is a must please let us know. We rented from you last year or in the past, should we expect everything to remain the same at the property or in regard to your rental policies and terms? No. Property owners make changes and updates to their properties, and sometimes we don't know about them right away. As soon as we know of changes we will let renters know. Will our rental have air conditioning? We have very few properties that have air conditioning units. The cottages/homes do come with fans to help circulate the air. If the rental property has a fireplace or woodstove may we use it? For insurance reasons some fireplaces/woodstoves are not available for use. If they are available for your use it will be listed in the amenities. May we use fireworks at our rental property? Even though fireworks are now legal in the State of Maine, you are prohibited from using them at our properties.